Angela Reed currently works in a senior nurse leadership position with the Northern Ireland Practice and Education Council for Nursing and Midwifery (NIPEC). NIPEC is a strategic organisation that works across statutory service provider, education, staff-side and independent sector organisations, supporting high standards of practice, education and professional development for nurses and midwives in Northern Ireland. For the last eight years she has led a regional initiative to transform and improve the way that nurses record care in Northern Ireland across a number of disciplines. This has included driving change to enable standardisation of data sets, setting standards for practice and transformation of the person centred care planning process to adopt a ‘once for Northern Ireland’ approach. Angela was awarded the Florence Nightingale Foundation Garfield Weston national leadership scholarship (UK wide) in 2017 which supports and funds personal and career leadership development through a chosen area of practice improvement. Northern Ireland is planning a change programme over the next 10 years to digitally enable health and social care services through the adoption of a citizen focused electronic health and care record (EHCR) for the country (1.8 million population, integrated health and social care). Angela is using this exciting opportunity to study ‘nurse leadership digital capabilities’ to enable nurse leaders (and midwives) to influence and contribute to this substantial change agenda. In the course of the project she has been making contact with nurse leaders, in the UK and globally, who have enabled and supported significant digital change (for example through the introduction of an EHCR) to learn how this was successfully achieved, looking particularly at the digital/informatics capabilities and leadership skills of the individuals engaged in programmes of work. 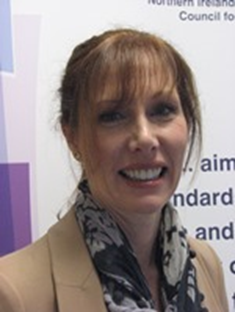 Sites she has engaged with so far include Cambridge University Hospitals Trust and Imperial College Healthcare Trust, London, visiting nurse leaders and speaking to front-line staff directly in clinical areas. Angela is planning a number of international visits in 2018, to take forward this important work and make connections to enable future knowledge exchange. Her visits should enable her to talk directly to senior nursing and midwifery teams who have led uni/multi-professional transformation to adopt new ways of working and practices for the purpose of implementing a whole system digital change. The product of this work will be a publication for the Foundation adding to the existing knowledge in this important area of practice. In March 2017, Angela was elected Chair of a Five Country Nursing and Midwifery Leadership e-Health Group comprising senior professional digital leadership from Scotland, England, Wales, Northern Ireland and the Republic of Ireland. The aim of this group is to support nursing and midwifery practice by promoting the safe use of digital health and social care technologies across the five countries of the United Kingdom and Ireland.